Me? I'm a details girl. I enjoy interior design.....I think. Not the fashion-bound type reliant on Pantone Palettes of the Year or glossy mags. Being prescribed what's 'on trend' brings out my bolshie boots; and any offer of having someone come in to create 'a scheme' for my living room would make me twitch. However, I confess to being a binge consumer of 'The Great Interior Design Challenge' when it's on and remember being spray-glued to the MDF showcase that was 'Changing Rooms' in the '90s. What always impresses me is how certain individuals can conjure up a whole re-imagined space in their mind's eye.....in a one-er....just like that. No time for ideas to percolate, to fatefully stumble across a chair 'that goes', or for preliminary cycles of furniture chess. Dunc, thankfully, is strong on spatial imagination. Over the last couple of months, we've made significant leaps forward in two of our rooms....well, actually four. Three continue to evolve in their own sweet time, but the bathroom has been one of those 'one hit' projects, heavy on the front-loaded decisions, layouts and functional considerations that I struggle with. Spirited out of two very utilitarian toilets (one which doubled as the CCTV hub!?! ), there wasn't that much in the way of creative kindling to get started with. But there was one spark - an original mullioned window. So while Dunc rolled up his sleeves, dusted off his tape measure, and set about creating spreadsheets and floor plans; I got into the details....tiles, colours, cabinet knobs, and how to get the best from the window. With 120 years of family and institutional life under its belt, it's not too surprising that the window has seen some re-glazing. Of the 63 leaded panes, seven were either cracked or had been replaced with mismatching glass at some point in time. Sourcing an exact match to the original glass seemed like a tall order, and I like the idea that the building maintains some markers of the war wounds it has picked up in the service of providing a home, shelter, and workplace for so many people. In Japan there is a tradition called kintsugi where broken ceramics are repaired with precious metals. No airbrushing of scars or clever camouflage make-up. No hurried sweeping the fragments up into newspaper and sneaking them into the bin. The pieces are conserved, cherished, jigsawed back together, and the new joins and edges are celebrated in gold and silver. This appeals to me on so many levels. I chat to our Deb (she of the magnificent door lights) about bringing new life to the window with stained glass, and share an idea I've had. What if the broken panes could be peepholes out into a briar thicket? 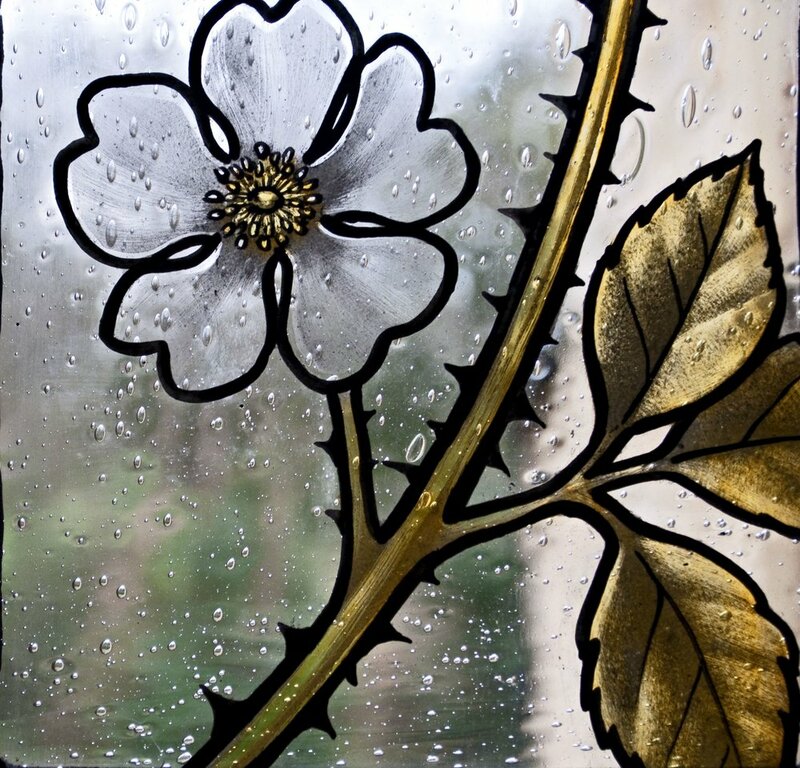 Deb runs with this, our conservation officer likes her design, and before we know it the day comes for Deb and Leon from Pendle Glass to install the new panes. So now we have our very own 'kintsugi' window, delicately painted in silver stain. Just a bit of sanding and painting and we can install the bath...where after a stressful day, I can float away through Deb's beautiful briars and into my own imagination for a while. Meanwhile, in the drawing room, we've been making changes bit by bit. It made a serious difference to morale to have Rob come in to decorate in here last year - spreading some Arts and Crafts magic over the walls with Voysey doves and squirrels. However, as is often the case with a drip-feed design approach, once one detail in a room is transformed, other bits begin to jar...and it's the fireplace that starts to niggle. We're lucky enough to have access to an image of Edgar Wood's original vision for this room and there is much in the watercolour which reflects how the room looks today. However, the fireplace is quite different. It is a proper focal point with a formal yet flamboyant canopy - the fireplace equivalent of the over-sized Victorian pram hoods of the time; and framed with beautifully crafted settles either side. 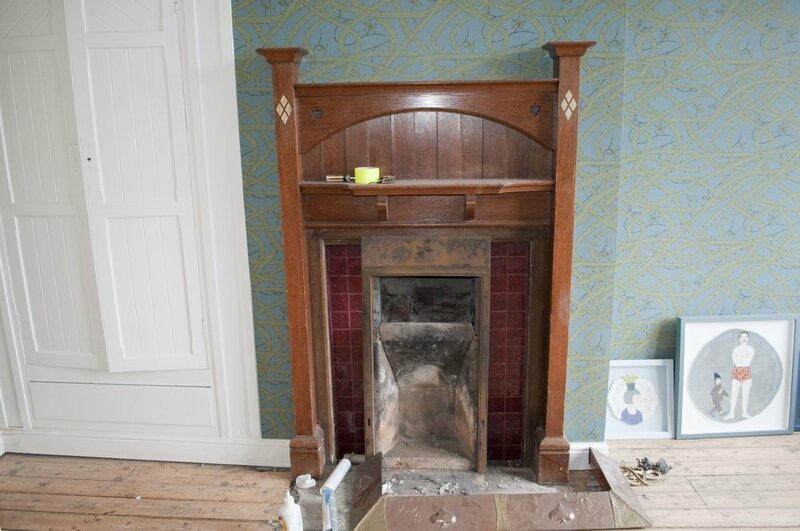 A time came, probably in the 1930s, when the Berry family must have declared the original fireplace 'so last century' and replaced it with something significantly less twiddly and more trendy. Another eighty years on and now no longer fashionable or original, we decide that it may be time for it to have another facelift. With help from David Morris from the Edgar Wood Society, we gather evidence to support our application for listing building consent to make a change. We're keen to re-introduce something of the Arts and Crafts spirit, but whereas in smaller rooms we've sought to source original fireplaces to fill the voids, we realise that it's pretty unrealistic here. What we can do, however, is to make use of natural materials and artisan hands; to reference the detailing on the other original fireplaces; and to draw on styling from the Arts and Crafts period for the design. Consent is duly granted. My first meeting with a stonemason isn't what I had hoped for. A tick for craftsmanship, there's no doubt, but we seem to talk at cross-purposes. There's a 'no' to having the stone finish textured to match the other fireplaces....something about health and safety; a portfolio of quite modern-looking designs; and a hard sell on a particular brand of stove. And then there is that subtle sense of being treated like 'the little woman' who doesn't REALLY know what she wants. 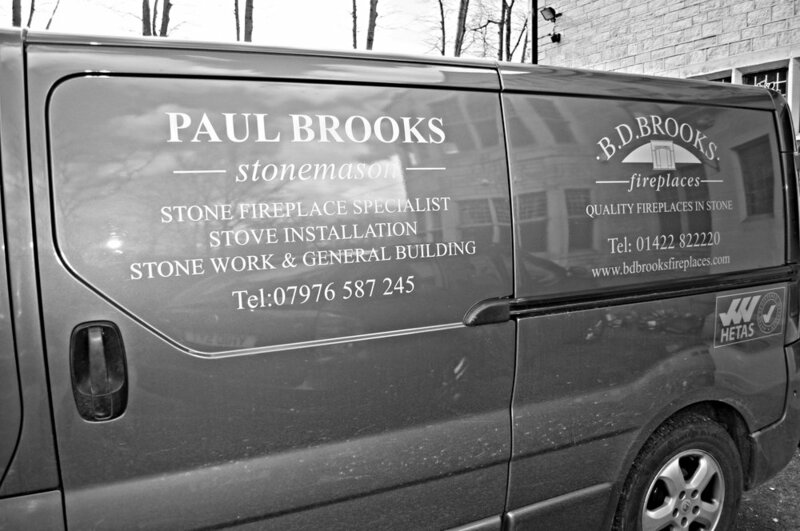 The search continues and quickly ends with a recommendation for Brooks Fireplaces in Ripponden. Right from the off, Brian Brooks seems to grasp where we're coming from. He cares about matching the stone and suggests sourcing it from Crosland Moor, where the original material for the house may have come from.....and no, the finish doesn't have to be as smooth as a curling stone. He picks out features from the other fireplaces to incorporate into the design, and comes equipped with a photograph of an Arts and Crafts fireplace which absolutely captures the essence of our vision. We exchange ideas and settle on a design to compliment the room - a focal point, but not one so ornate as to detract from the lavish plasterwork ceiling. Next time we meet, he brings us a beautifully crafted letter E in Crosland Moor stone so that we can see and touch how the stonework will be. It's perfect. The world of stoves is pretty mind-boggling for the uninitiated, so we're glad of a recommendation from Dunc's dad which is seconded by Brooks. And after a couple of months, another exciting installation week arrives. Paul and Lewis - Brian's brother and son, start work on fitting the stone fireplace walls and hearth. We're delighted that Paul also finds time to fit the reclaimed fireplace that has been loitering in a corridor for over a year. Its final destination is a chimney breast which Dunc has excavated. In the process, he has found some original and beautifully-coloured pea green tiles both in the wall and underneath a layer of concrete which must have been poured over the original hearth. It's sad not to find a way to incorporate them into another fireplace, but it would be virtually impossible to remove them without damage. So we photograph them as a record and leave them in situ for someone else to discover in years to come. We found treasure underneath the cover of the bedroom fireplace too - this time, dark crimson tiles, almost perfectly intact; and Paul is tasked with fitting a reclaimed insert without damaging them. Not only does he succeed, but he does a brilliant job of polishing it up, transforming our bargain 'eBay special' into something rather beautiful. With the drawing room fireplace surround almost fully installed, it's time for the chimney lining to arrive. Watching the flue liner fitting would have required smelling salts if it wasn't for the hire of a cherry picker. Feeding a very long and broad piece of tubing down into a very high and relatively narrow hole is quite a feat, but we have Dylan and Sophie on hand, collectively known as 'Doctor Flue', and thankfully no other medics are required. And so it is, on a freakishly warm day in March, that the drawing room fireplace undergoes its latest Dr Who-style regeneration. The legend that Brian has carved pretty much sums us up. Our new fireplace and stove...just in time for a warm spring!